Wiremold FloorPort™ Flanged cover assembly in brushed aluminum color, is ideal for using with tile or carpet installation. 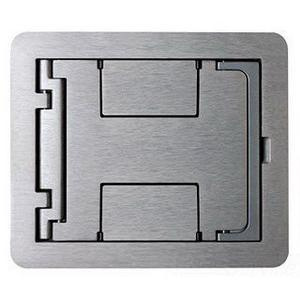 This rectangular cover assembly features die-cast aluminum construction. It comes in blank top configuration. Cover assembly measures 6-1/2-Inch x 7-3/4-Inch. Cover assembly is cULus listed, RoHS compliant and meets Article 314.27 C, NEC standards.